Playgrounds are spaces of encouter from which nobody should be excluded. In the course of planning barrier free playgrounds it therefore matters to eliminate barriers in such a way that all the children, independently from their physical constitution and composition, can use a playground and access the play equipment. To achieve this goal is an enormous challenge and requires continuous research and design iteration. On the one hand, offers have to be created which support and appeal to children with and without disability. On the other hand, there is a great range of different disabilites. Children with hearing or visual impairments need play offers which make us of smell, tactility, sound. Children who sit in wheelchairs need paths which are navigable with wheelchairs on the playground and accessible play equipment, like merry-go-rounds or see-saws for wheelchair users. Earlier efforts of constructions of barrier free play offers in Germany, or in Berlin, succeeded rarely. Children have the need to participate actively and not be passive observers. They also need interaction with nature during outdoor play. It stimulates the mind, strengthens the body and helps to develop a sense of wonder and imagination. Soft play sculptures, accessible play equipment and cushioned play surfaces provide recreational opportunities and a multi-sensory experience enhances immersion. Our ideas reached from developing a whole playground concept, very much like a theme-based park, to single playground elements. At first, we planned to build a labyrinth as it fulfills the requirements for inclusion mentioned before, but then we decided on designing a swing as we found universal design is of high complexity as many factors need to be considered. 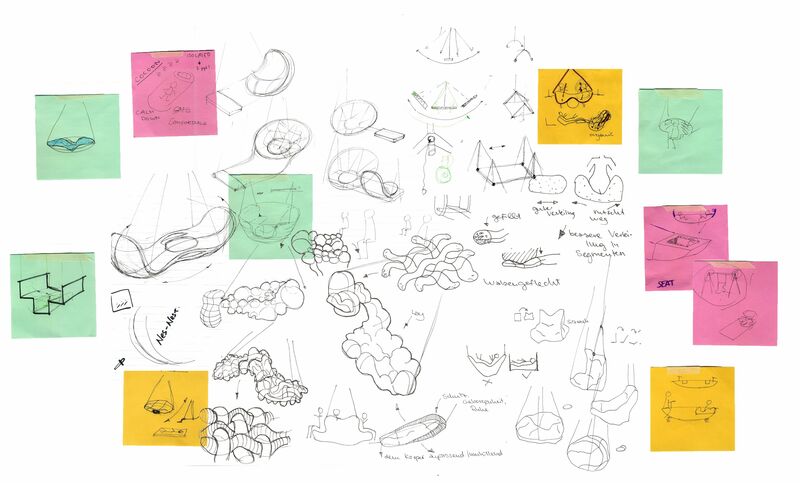 Even then, we found that redesigning an object which is a regular feature of certain public spaces comes with a lot responsibilty and it is very challenging to find a shape and material that suits everybodys needs. On the basis of our interviews and the design iteration, we tried to develop an object which appeals to the humans basic needs. Cloudi is not barrierfree in the sense that you roll with a wheelchair on it. But it is inclusive.